India has at present four categories of protected area (PAs), these are National Parks, Sanctuaries, Conservation Reserves and Community Reserves which are provided legal sanctity by the Wildlife (Protection) Act 1972. However, there are six categories specified by the IUCN (International Union for Conservation of Nature) and different countries have different categories of PAs as per their requirements and norms laid by their Governments. In Sikkim we have, presently, 9 Protected Areas which comprises of 1 National Park, 7 Wildlife Sanctuaries and 1 conservation Reserve that covers 30.77 per cent of the total geographical area of the state. 1. Protected Area Network including KBR = 3330.28 Sq Km i.e 46.93% of States Geographical Area. 4. Wildlife Sector [KNP + Sanctuaries + Conservation Reserve = 2183.70 Sq. km] i.e. 30.77 % of State's Geographical Area. Notification# S. O. 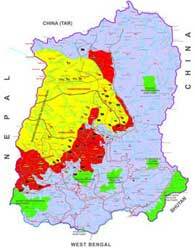 2166 dated 27th August 2014, notifies an area up to 200 meters around the boundary of the Khangchendzonga National Park as the Eco-sensitive Zone. The draft of the Notification was published on 3rd February 2014. Notification# S. O. 2167 dated 27th August 2014, notifies an area up to 25 meters around the boundary of the Kitam Bird Sanctuary as the Eco-sensitive Zone. The draft of the Notification was published on 25th February 2014. Notification# S. O. 2168 dated 27th August 2014, notifies an area up to 200 meters around the boundary of the Kyongnosla Alpine Sanctuary as the Eco-sensitive Zone. The draft of the Notification was published on 4th February 2014. Notification# S. O. 2169 dated 27th August 2014, notifies an area up to 50 meters around the boundary of the Shingba Rhododendron Sanctuary as the Eco-sensitive Zone. The draft of the Notification was published on 6th February 2014. Notification# S. O. 2170 dated 27th August 2014, notifies an area up to 50 meters around the boundary of the Maenam Wildlife Sanctuary as the Eco-sensitive Zone. 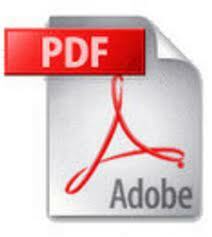 The draft of the Notification was published on 25th February 2014. Notification# S. O. 2171 dated 27th August 2014, notifies an area up to 25 meters around the boundary of the Fambonglho Wildlife Sanctuary as the Eco-sensitive Zone. The draft of the Notification was published on 4th February 2014. Notification# S. O. 2172 dated 27th August 2014, notifies an area up to 50 meters around the boundary of the Barsey Rhododendron Sanctuary as the Eco-sensitive Zone. The draft of the Notification was published on 25th February 2014. Notification# S. O. 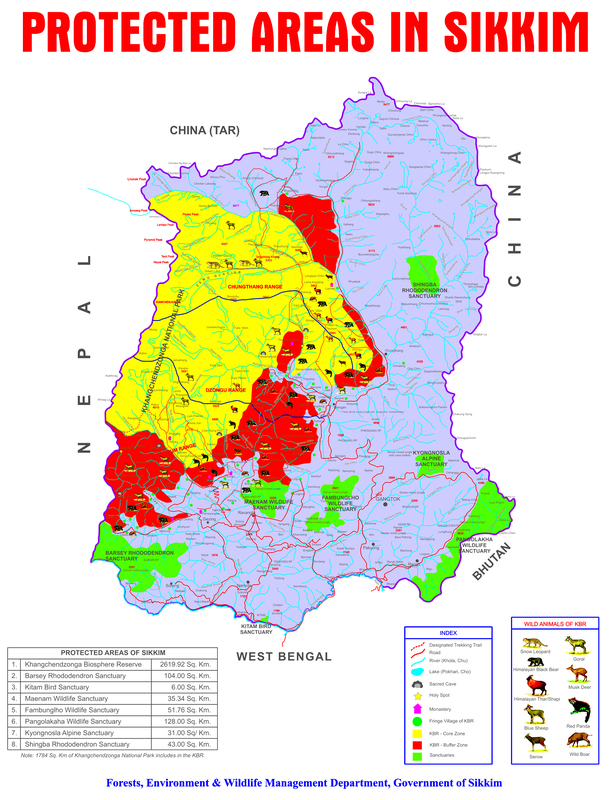 2173 dated 27th August 2014, notifies an area up to 50 meters around the boundary of the Pangolakha Wildlife Sanctuary as the Eco-sensitive Zone. The draft of the Notification was published on 6th February 2014. Situated in the magnificence of Gangtok’s picturesque hill crest, Bulbulay, at altitudes ranging between 6,545-8,152 feet, the Himalayan Zoological Park sprawls over the expanse of a lush virgin forest reserve with an impressive total area of 230 hectares overlooking the majestic beauty of the Khangchendzonga range. It’s varied terrain ranging from steep rocky surfaces to gentle grassy slopes complemented by varying types of foliage offers congenial natural surroundings for many of Sikkim’s indigenous species, hence providing a comfortable and close to nature environment for the inmates to stay immersed in the wild.